Think of your blog as a house, with each piece of your blog being a different room. The host is the kitchen where all the magic gets cooked up. As the master chef it’s up to you to make sure things run smoothly and all the right ingredients get put into place. You need to make sure you have the secret sauce that makes your blog stand out, a clean house that makes it easy to find what you need, a simple ways to share what needs to get done, all inside a sound structure where your audience will feel like they can kick back, relax, and enjoy what you’re serving. I’ve held steadily on to 150,000 pageviews for the past 5 months now. After doubling my pageviews, I learned some valuable lessons that need to be in place when traffic starts rolling in. One thing I’ve come to understand is that if you give your audience what it wants in a way that you feel passionate about, your blog will continue to strive. People will continue to come back for more, they share about their experience with your blog, and you’ll come to be respected in your focus areas. Whether the pageviews are pouring in or not, your website should be ready for an influx of traffic. After all, the more pageviews you have normally translates to more sales, more followers, and a more responsive community. Here are 5 things a high traffic blog needs. You need a good website, of course! A beautiful website goes a long way. But don’t forget about who is actually making sure your pageviews are intact. There are lots of bugs and mishaps that happen online. I know my own site has been down a time or two over the years. That’s why I’m vigilant to find the best host for a blog. I’ve been using (and recommending) SiteGround for years now. Currently they are running a promotion with plans for 70% off and they also offer free site transfer. Meaning, if your site is hosted somewhere else, they will transfer your site for free. Bottom line, you need a hosting provider that can handle your traffic. I remember when I first moved to WordPress I wasn’t with SiteGround, I was with a much more well known hosting company. When my pageviews spiked my blog went down. Frantic and desperate, I turned to their customer support and received bland and canned responses. What I value so much about SiteGround is the overwhelming customer service. I’ve done the research and can tell you this is the BEST option out there. P.S. Here’s my quick-start blog guide. So many people focus on beautiful blog designs but forget that when people arrive they want to find what they are looking for. My advice is to keep it simple. Make your search bar and menu clear and legible. Have a flow to your blog leading the reader through different posts and explain what you’re about. If you haven’t yet, sit down and write down your blog’s mission statement. What do you hope to convey when someone lands on your blog? I don’t believe in niches but I do believe in mastering some focus areas. That means when someone arrives to your blog they should be able to quickly and easily grasp onto the areas you focus on, find the information they are looking for, and give them a reason to stick around. Of course, your blog “house” should be pretty. I personally recommend WordPress (I’ve tried them all) and like using the Genesis Framework. I’ve said above I recommend SiteGround for hosting. 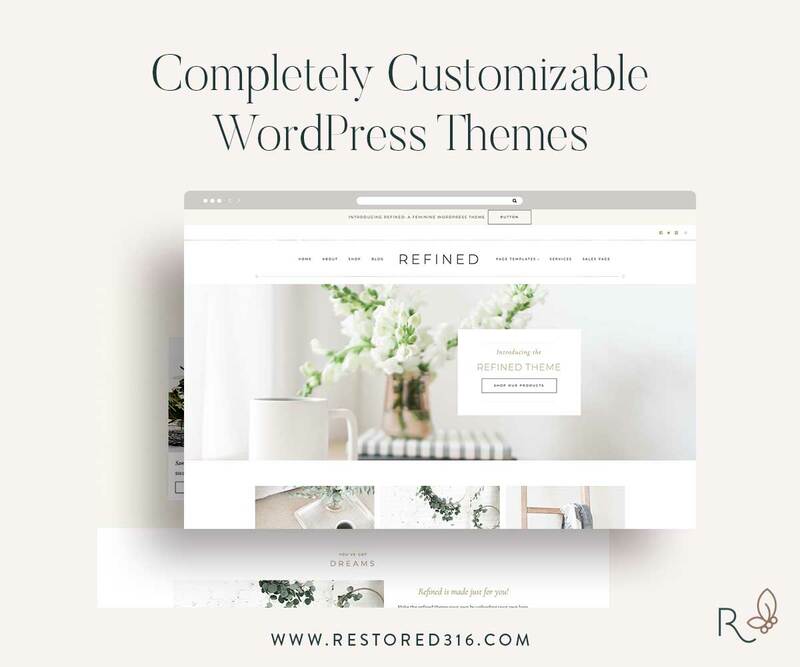 As for design, I love the Restored 316 themes (this is what I currently use for my blog design) and also recommend finding many options inside of Creative Market. Whatever you choose, you want to keep it simple enough so that a new reader can easily navigate to what they are looking for. Which brings me to my next point. Imagine you find a hilarious video of a puppy dancing to salsa music. It makes you laugh out loud and you know that your friends would enjoy it too. You go to click “share” but the button is broken! What do you do? Do you spend 10 minutes trying to find a way to share it? Do you take screen shots to send to your friends? Or… do you click away? Most often, you move on. We don’t have the time to waste to frantically find a way to share an article or something we love. You need to make it STUPID easy. It should be right there without being over-the-top in your face. I recommend using the (free!) SumoMe plugin. This is what you’ll see on the left side of my blog that follows you as you scroll through my blog post. I keep the options simple and in line with my blog. You click what you want and it’s easy to share (go ahead and try it on this post, I dare you!). Another I recommend is Social Warfare, a paid for plugin that works well and gives your blog a streamlined way for people to share your posts. Whatever you choose, give people the option to share your blog every time. What stands out to me immediately when reading a blog is when I find that I attach to a blogger’s voice. Look, there are millions of blogs out there. Every one is vying for similar things: gaining readers and traffic. One of the best ways to stand out is by using your own unique voice. It can (and should) take time to find your stride. I believe we all have the ability to craft our unique voice and let it shine through our blogs. Here’s how to find your voice for your blog. Going along with your strong voice, you need content that counts. I think the best kind of content you can write is foundational content. So often we focus on strategies for getting traffic to our blogs without focusing on the heart of the matter: is your content relatable to your desired audience? This can be a tough question to answer, of course. Which is why I think it’s necessary to write down who your audience is: what are their interests, desires, pain points, and passions? And then, how do those go along with what you write about? Again, this is not one of those things that comes over night. But as you grow as a blogger it’s something to pay particular attention to. Once you’ve narrowed in on your voice and content, create a headline that counts. According to CopyBlogger: 80% of people will read your headlines but only about 20% will actually click. If you want that percentage to rise, you need an attention grabbing headline. I specify how to craft those right here. But think about why you might click to read and article and remember that in your arsenal of tools when you go to write a blog post title or share on Twitter. If you spend all your time on social media you could be losing valuable traffic. Social media is great and necessary to grow your blog. But it isn’t everything. Don’t forget to write catchy headlines and create a post that leaves a mark. I know that it can be overwhelming to find time to figure out what works for social media, so my advice is to pick one platform to dedicate time and energy to. For me, I like to schedule posts on Pinterest, Twitter, and Facebook and then focus my time and effort on Instagram. A successful blog is one that has consistent pageviews, followers, and great content that gets shared. If you’ve created a strong house and foundation for your blog it will continue to grow over time. Cook up your blog plan and don’t be shy to constantly learn more along the way. The best thing you can do for your blog is provide quality through passion and purpose. Just remember that building something that you want to last takes time! You don’t have to have all the answers right away. This 6 day video course will help you start a profitable blog, the right way! Got it! Check your email for the free ecourse.